When I’m out of toilet paper, dog food or paper towels, a drive to Costco is in order. All three at once? I’m there! Of course, the trip doesn’t end with those immediate needs. In fact, (true story) I cannot get out of that store without a grand total receipt of less than $350. It’s always been that way, but over the years I’ve noticed that my cart contents have changed. Costco helps remove this barrier, by sampling, but unfortunately, you can’t always time your visit when they’re sampling the items you’re curious about. 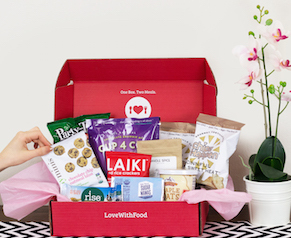 Of course, when you discover new brands on a monthly basis through a snack subscription box like Love With Food, you’re destined to find favorites in Costco that you’ve already tried at home. Judging from my latest visit, here are a few healthy snacks that you could find on your next TP run. Oloves: These one bite wonders are ideal munching on the go. Just ripe, pitted olives marinated with natural seasoning and nothing else, Oloves prove that simpler is better. Packed convenient pouches without any brine or liquid, they’re perfect to perk up the ol’ lunchbox or to toss in your gym bag for some emergency eats. Seapoint Farms Energy Blend: Not that I’m against chocolate chip spiked trail mix or anything, but sometimes it’s got to be about the protein. In this situation, Seapoint Farms has got your back. Made with crunchy soybeans, dried cranberries, almonds and pumpkin kernels, we’re talking a heart healthy protein snack with a kiss of sweetness to make it go down easy. Sahale Snacks Pecan-Cashew Nut Crisp: Way to turn healthy into delectable! Pecans and cashews combined with dried fruits and sweet seasoning, who can resist? Add to that, these Sahale Snacks are gluten-free for equal opportunity noshing. Sold! Made in Nature Fusion Organic Dried Fruit: Organically and sustainably farmed dried fruits are the stars of this snack. While ingredient lists remain simple and pure, the flavors when combined are unique and unexpected. Made in Nature Fusion flavors include banana, coconut, pineapple and ginger or raisins with cherries, pepitas and goji berries. No added sugar, no sulfur, no artificial anything. Yes please! Bare Crunchy Apple Chips: Anyone else have a prob getting their 5-a-day? Now you can have your apple and eat your chip too. That’s right, Bare chips are baked, not fried and 100% natural non-GMO verified apples. Nature’s Bakery Fig Bars: Why are Nature’s Bakery Fig Bars so dang delish? Because they don’t rely on bells and whistles. Stone ground whole wheat crust wrapped around chewy, rich, fruity fillings with no junk added is what a snack is supposed to be, right? 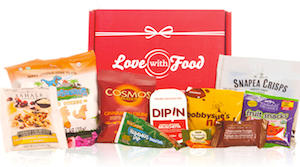 Which Love with Food snacks have you found at Costco? Tell us in the comments section below.